As I’ve noted many times: on the Internet, content is forever. Even if something is removed from a site or blog, it can be found in the 55 billion pages archived on The Wayback Machine archives. So it’s really hard to understand the growing furor over a new feature launched by Facebook yesterday that is essentially a giant newsfeed on its 9.5 million members. 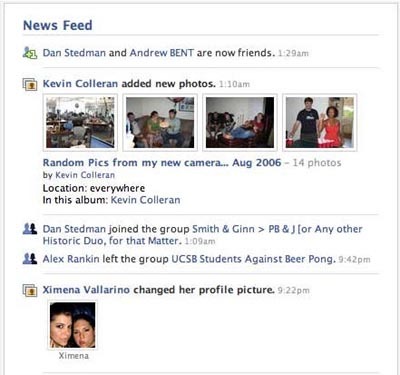 The feed, removes the need to go to the site of every friend or acquaintance in your network every day to see what changes occured to their profile. But it was immediately dubbed dubbed “Stalkerbook” by thousands of protestors, whose ranks are growing exponentially. And that’s just ridiculous. Emails are flying, exhorting people to “Stop the New Facebook.” And there’s already a blog “A Day Without Facebook,” calling for a Sept. 12th boycott. Granted, kids – who are the majority of Facebook’s users – may be naive enough to think that they have privacy in their social networks even if they don’t use the optional – and very clear – privacy settings. But the bottom line is, and always has been, if you don’t want the whole world to see it, don’t put it on the Internet. OK BL, I’m sorry but you clearly have never experienced the facebook as a user. What people have been protesting is not the fact that the information is “out there” (since we all know everything posted online is), but a format that tracks every single step you take within the system an showcases it to EVERYBODY. If I reject the invitation to a party, it is disclosed in big huge letters in the center of the page; if I decide to say hello to a friend it automatically tells EVERYONE I said hello, and so on. Before, you always knew who had changed his/her profile by just clicking on a very subtle (normal sized) button named “friends”. This is no advantageous feed but a ridiculous addition to the facebook user experience. Those of us who believe in user generated content think sites such as the facebook should respond to our tastes and needs even if they are stylistic details. Clearly, this new layout has failed among users and should be reversed. I really hope you post this and rethink your position about this changes. Thanks!! Me again! Just thought you’d like to know the latest about this story. Mark Zuckerberg (founder of facebook.com) published the following letter in all of facebook members’ log in page. I am so proud of them for standing up to their principles and listening to the users. Bravo to their team for updating the privacy settings and accomodating a more rational and controllable feed. Somehow we missed this point with News Feed and Mini-Feed and we didn’t build in the proper privacy controls right away. This was a big mistake on our part, and I’m sorry for it. But apologizing isn’t enough. I wanted to make sure we did something about it, and quickly. So we have been coding nonstop for two days to get you better privacy controls. This new privacy page will allow you to choose which types of stories go into your Mini-Feed and your friends’ News Feeds, and it also lists the type of actions Facebook will never let any other person know about. If you have more comments, please send them over. About a week ago I created a group called Free Flow of Information on the Internet, because that’s what I believe in – helping people share information with the people they want to share it with. I’d encourage you to check it out to learn more about what guides those of us who make Facebook. Today (Friday, 9/8) at 4pm edt, I will be in that group with a bunch of people from Facebook, and we would love to discuss all of this with you. It would be great to see you there.